It bakes to hardness in the oven at 275°F (130°C) for 15 minutes per 1/4" (6 mm) thickness. It requires no painting. Individual colors are sold in 2 oz (57 g) blocks. 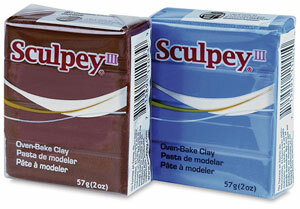 ® Sculpey is a registered trademark.